"Looking for a Way to Save Money on Wine and Impress Your Friends at the Same Time? - This Danish Quality Checked Wine Aerator and Pump Set is Your Answer!" Want to be able to serve wine with style and impress your friends with flavor bursting wine at your dinner parties? Forget about imitators or overpriced brands that disappoints. Our premium quality wine aerator and pump set is made for you - nothing else compares. Our 100% customer satisfaction guarantee makes this purchase a no-brainer! You're here for a reason...invest in this set to get the most out of your wine and beverages. The joy of serving a wine at it's full potential is worth far more than the price you're paying. If you've tried other products (even other wine aerators or pumps) but weren't happy...you NEED to try this set! PLEASE STOP AND READ THIS BEFORE BUYING ONLINE OR FROM A STORE... 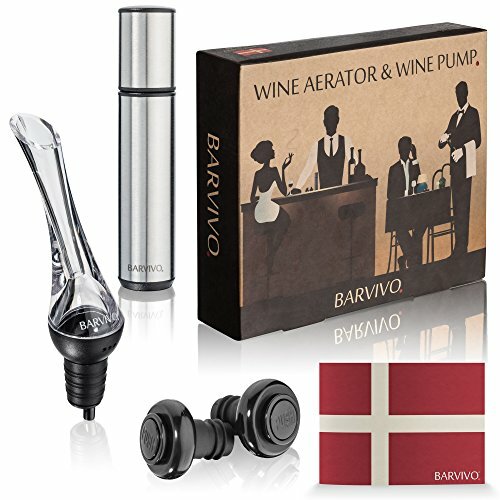 Most sellers or stores don't want you knowing that cheap aerators and pumps won't enhance and preserve the wine as well as the BARVIVO wine set. Be careful, imitation sets (not made like ours) will leave you disappointed. If it's not guaranteed, don't buy it. From the manufacturer: Our wine set is difficult to keep in stock. Occasionally, a media story or celebrity endorsement will cause demand to spike quickly. If you see the green "In Stock" above, place your order before they're gone. We appreciate your business. ---> Simply Click "Add to Cart" to claim the best value premium wine aerator and pump set. So order now and when you do consider getting two, one for you and one for your very best friend. POUR, ENJOY AND SEAL YOUR BOTTLES WITH EASE - Pouring and aerating wine using this aerator instantly enhance the flavor of your wine. Making a cheap bottle of wine taste 3 times better than originally - You'll even be able to enjoy just one glass since preserving using a stopper has never been easier - Preserve red, white, rose and port wine everything besides sparkling beverages for up to 14 days - The cost of this set has been covered in value after you've enjoyed your first bottle of wine. IMPRESS YOUR FRIENDS WITH EXPENSIVE TASTING WINE - Never before has it been this easy to impress your friends, not only will you be able to serve wonderful tasting wine but you'll also be able to present a new cool wine accessory. Even the decanter using wine enthusiast will be shocked by the aroma and flavor of the wine after aeration using this premium pourer and by the fact that it won't drip like most decanters do. This set has everything you need to serve wine at your next dinner party. DON'T BUY ANY WINE POURER OR WINE PRESERVER ONLINE OR IN A STORE BEFORE READING THIS - Other aerators, pourers and preservers made of glass, disk foil, rubber, stainless steel, cork, cheap plastic or acrylic often leaks when you pour and doesn't aerates your wine with the optimal amount of oxygen like this spout will and other vacuum bottle sealers doesn't preserve wine for as quite as long as this BARVIVO wine pump and stoppers set do. Don't compare on price, you get what you pay for. THE UNIQUE AND EXQUISITE BARVIVO PACKAGING - Imagine walking into your very best friends' birthday party and handing him this stunning decorative gift box. The eye-catching box and the story which unfold itself on it will create lasting memories for you and your loved ones. It's a great icebreaker, makes an excellent and fun topic of conversation at dining parties. Festive, stylish and people will save this box because it looks amazing, stores all the accessories perfectly and say "I care!". LOVE YOUR NEW WINE SET OR WE'LL SEND YOUR MONEY RIGHT BACK - Not only do you get a new wine set which enhances your wines flavors but you also get our top rated customer service combined with our 6 months warranty at no additional cost. If you don't absolutely love your new wine set we'll offer you a replacement and/or refund your money, no questions asked! Which makes this purchase a no-brainer - So order now and when you do consider getting two, one for you and one for your very best friend.